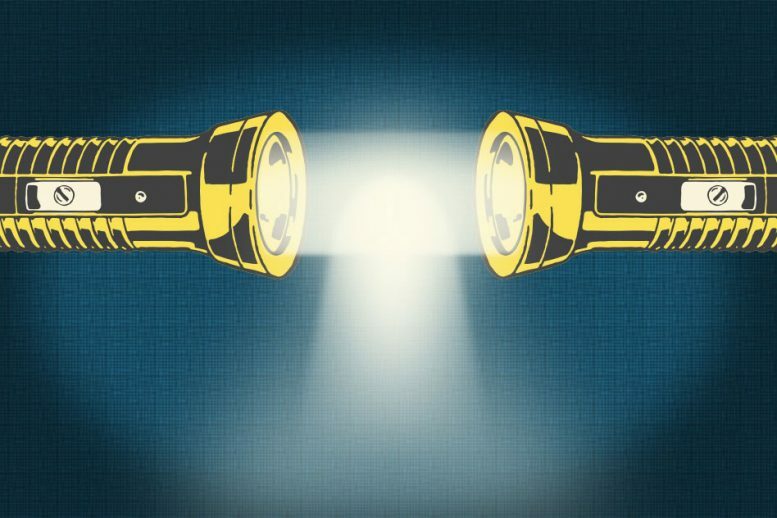 Vuletic and Lukin lead the MIT-Harvard Center for Ultracold Atoms, and together they have been looking for ways, both theoretical and experimental, to encourage interactions between photons. In 2013, the effort paid off, as the team observed pairs of photons interacting and binding together for the first time, creating an entirely new state of matter. To find out, the team used the same experimental approach they used to observe two-photon interactions. The process begins with cooling a cloud of rubidium atoms to ultracold temperatures, just a millionth of a degree above absolute zero. Cooling the atoms slows them to a near standstill. Through this cloud of immobilized atoms, the researchers then shine a very weak laser beam — so weak, in fact, that only a handful of photons travel through the cloud at any one time. In addition to tracking the number and rate of photons, the team measured the phase of photons, before and after traveling through the atom cloud. A photon’s phase indicates its frequency of oscillation. The researchers then developed a hypothesis to explain what might have caused the photons to interact in the first place. Their model, based on physical principles, puts forth the following scenario: As a single photon moves through the cloud of rubidium atoms, it briefly lands on a nearby atom before skipping to another atom, like a bee flitting between flowers, until it reaches the other end. The entire interaction within the atom cloud occurs over a millionth of a second. And it is this interaction that triggers photons to remain bound together, even after they’ve left the cloud. “What’s neat about this is, when photons go through the medium, anything that happens in the medium, they ‘remember’ when they get out,” Cantu says. This means that photons that have interacted with each other, in this case through an attraction between them, can be thought of as strongly correlated, or entangled — a key property for any quantum computing bit. 4 Comments on "MIT Physicists Create a New Form of Light Where Photons Interact"
Somewhere Egon is telling Peter, don’t cross the streams! Yeah, because that’s what society needs right now: Open-carry light sabers. (draft from my next volume) -Light is the result of longitudinal pressure waves in the Ether, the interaction with matter has a traverse component that leaves a signature with an induction that can be detected traveling at 299,792,458 m/s, even though nothing more than a pressure gradient is changing. The imaginary Photon and Electron are mere illusions that are just shadows on our detection instruments. There is wave interference and conjugation that also appear on our detection devices, again nothing more than Ether wave mechanics 101. Regards Arto.